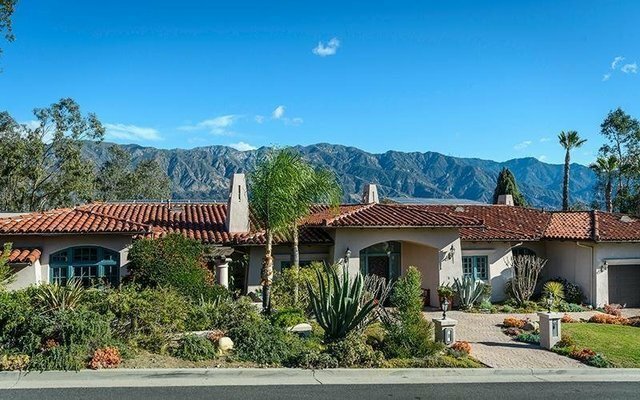 This stylish Contemporary Hacienda sits on a quiet Flintridge wide, flat cul-de-sac with plenty of parking and room to play. Sweeping views of the mountains are enjoyed from most rooms.The flexible floor plan allows the home to function as a single story home perfect for all ages, but with the luxury of the lower level making home theater, guest apartment or studio space possible. Wide hallways lead to large rooms with high ceilings, walls of glass, and many French doors. Gracious master suite has sitting room, full bath, and huge closet.Sunny atrium opens to private patio with fountain. Family room flows to vacation-at-home yard featuring pool with waterfall, spa, built-in BBQ with serving area, seating and dining areas, and view. A bonus: Solar panels pay the owner's monthly bill.